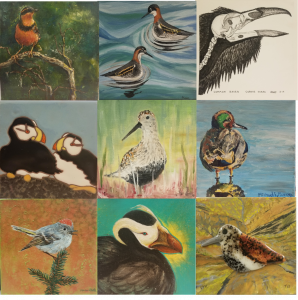 Over 25 artists have created original, avian inspired art works on 6×6 canvases. These pieces as well as birder-friendly “get-aways” will be auctioned off to raise funds for the Festival! If you can’t attend the festival, that’s okay- we’ll mail you your winning items! Attendees can pick up items after 1pm, May 13th. All proceeds benefit the Kachemak Bay Shorebird Festival! Bid Today! Join us for a “First Friday” event, featuring this year’s 6 x 6 Art Auction pieces. Enjoy live music, delicious locally roasted coffee, and bid on items in support of the Kachemak Bay Shorebird Festival.